"Société Nautique de Genève defending yacht will be constructed in Switzerland in compliance with the provision in the Deed of Gift. The Deed only requires the “yacht or vessel” to be constructed in the respective country and does not expressly impose obligations in respect of any of the separate components onboard the yacht or vessel. "We remain willing to meet and discuss to resolve any concerns you may have, although until there is certainty as to what “yacht or vessel” SNG will declare for the Match the issue would appear to be theoretical and moot until then." "Thank you for your letter of December 27th concerning the "constructed in country" requirement of the America's Cup Deed of Gift. "This is to confirm that GGYC welcomes your offer to meet and discuss this issue, which, as you know from our letter of December 22nd, we believe is of the utmost urgency. We are prepared to meet at a mutually agreeable time and place as soon as possible. When and where would you suggest?" "I refer to our letter dated 27th December 2009, a brief email message I have received in response from your representative Mr. Ehman, your press release dated 28th December 2009 and your letter of 29th December 2009 welcoming our offer of ameeting to discuss the concerns you have raised. I am pleased you have accepted our offer of a meeting, and I hope we can continue the recent good progress we have both made in Sydney. "Given the success of the Sydney meeting, I propose the meeting is again held before the America’s Cup International Jury Chairman Mr. David Tillett. We have spoken to Mr. Tillett and he can be available for a meeting. He will respond directly to both competitors to confirm a date and place for the meeting. "You have raised concerns regarding possible sails and other unspecified equipment that might be used on a yacht or vessel that SNG may select to defend the America’s Cup just prior to the commencement of the first scheduled race of the Match, on 8th February 2010. As expressed in our previous letter, SNG defending yacht will be constructed in Switzerland in compliance with the provision in the Deed of Gift and SNG disagrees with your interpretation of this provision of the deed of gift. SNG observes the Deed only requires the “yacht or vessel” to be constructed in the respective country and does not expressly impose obligations in respect of any of the separate components onboard the yacht or vessel. "Should your proposed interpretation be followed, SNG would have similar concerns regarding a number of items of equipment onboard the USA. SNG is also concerned that USA’s rig is not as described in your challenge documents dated 11 July 2007. "It is sensible that our respective related mutual concerns be discussed and addressed together at the same meeting. "Once we have confirmation of the date and place, we will advise our representatives that will attend the meeting." Andrew Saies and Crew from TWO TRUE Final Prizegiving Ceremony at the Royal Yacht Club of Tasmania. 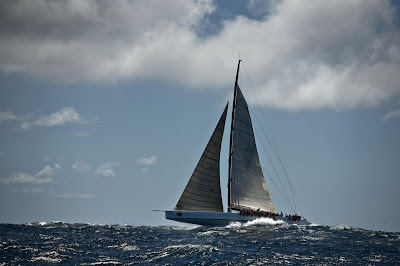 Image copyright ROLEX/Kurt Arrigo. With both the Governor and the Premier of Tasmania in attendance, the Rolex Sydney Hobart Yacht Race came to a close today when the prizes were presented to all the winners of the 628 nautical mile race at the Royal Yacht Club of Tasmania, in Sandy Point, Hobart. Joining His Excellency, the Honourable Peter Underwood AO, the Governor of Tasmania and Mrs Underwood and The Honourable David Bartlett, Premier of Tasmania and Mrs Bartlett were Mr Matteo Mazzanti, Rolex Geneva (SA) and the Commodores of the race’s organiser, Matt Allen for the Cruising Yacht Club of Australia and Clive Simpson for the Royal Yacht Club of Tasmania which finishes the race. Prior to the prize giving ceremony, Commodore Allen called for one minute’s silence in remembrance of Andrew Short and Sally Gordon who died as a result of an accident in the Flinders Islet Race in October. He then read ‘The Sailor’s Farewell'. “It was inspiring having Matt Short (Andrew’s brother) and his family in the race this year,” remarked the Commodore who said the CYCA was still counting the hits on the Rolex race site; “we can’t count that high,” he said. Both commodores thanked officials and volunteers, along with the race director Tim Cox, the international jury, Martin James for his design of the race tracker (the first in the world), John Winning for the use of his services and motor vessel the ‘JBW’ which acts as the Radio Relay Vessel for the race and David Kellett who manned the radio aboard. RAN (UK) - Niklas Zennstrom - IRC Div 1 winner. Image copyright ROLEX/Kurt Arrigo. There was no sign of the emotion of yesterday after the protest hearing when Andrew Saies was handed the highly prized Tattersall’s Cup today for Two True’s win. Instead it was a broad grin when he accepted the famous trophy. 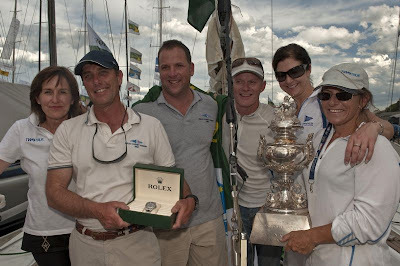 “Thanks to Rolex for their sponsorship,” said Saies who also thanked the two yacht clubs involved in the race. “I had a great boat and a great crew,” the South Australian winner said. 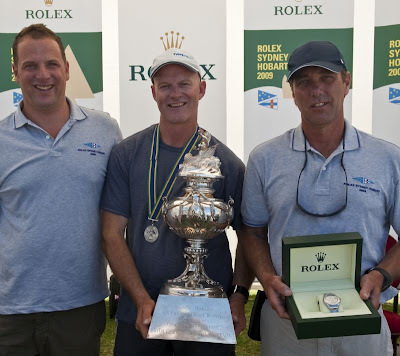 Australian sailor Chris Hosking accepted the British entry RÁN’s prize, as owner, Niklas Zennstrom had to return to England. “The owner is very happy with the race and his result. He’s only sorry the boat was delayed in arriving in Australia and he wasn’t able to race in the Rolex Trophy Rating Series,” Hosking, his boat captain said. Alfa Romeo on her way to Hobart and both line honours and a Div. 0 win. Image copyright ROLEX/Daniel Forster. On behalf of Neville Crichton, Jonno Morris accepted the JH Illingworth trophy and replica, awarded to Alfa Romeo for winning line honours. Alfa Romeo won so much silverware that Morris needed assistance to carry it out of the RYCT! Morris, the managing director of McConaghy Boats, was thrilled to note that the top three boats on line were all built by McConaghy. The Jane Tate Memorial Trophy, a perpetual trophy awarded to the first woman skipper on corrected time, was presented by her daughter, Mrs Kath Worbey in memory of her mother who sailed in the second race and was the first woman to complete the event. Also honoured at the ceremony was Bruce Gould, a Sydneysider who is originally from Hobart. He sailed his 40th race aboard Geoff Hill’s Strewth (NSW) and finished 48th overall. During his 40 races, he won in 1987 aboard Pacha, scored the line and double wins in 1987 on Sovereign and was a survivor from Winston Churchill in the disastrous 1998 race. Mrs Kath Worbey presenting the Jane Tate Memorial Trophy to Rebecca Walford, skipper Discoverer of Hornet, representing the Royal Air Force (UK). Image copyright ROLEX/Kurt Arrigo. 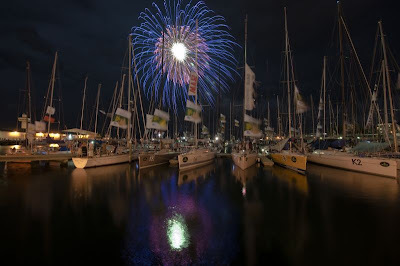 Greg Prescott from Tasmania, Tony Kirby from NSW, Peter Hopkins from Tasmania and Robert Case from Melbourne all achieved their 25th Hobart in this Rolex Sydney Hobart Yacht Race. Prescott did not make it all the way as Limit suffered rigging damage. 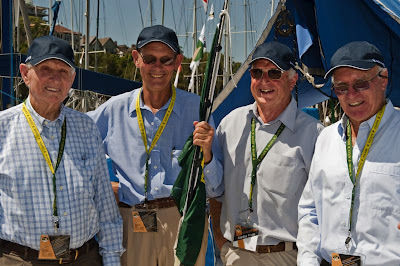 Veterans of more than 40 Sydney-Hobart races, prior to the start of the 65th Rolex Sydney Hobart Yacht Race, left to right: Syd Fischer - 41, Bruce Gould - 40, Tony Ellis - 43 and Bill Ratcliff - 42. 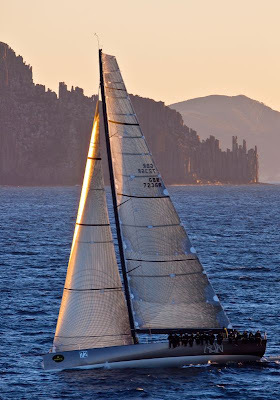 Image copyright ROLEX/Kurt Arrigo. Kirby steered his own Patrice Six to a solid fifth overall and third in Division 3 and Hopkins sailed aboard Valheru. Case is the most unique. 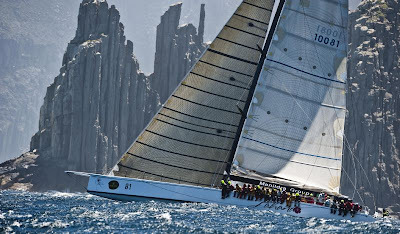 He has not missed a single Hobart race since he was 16 and this year sailed on Ichi Ban, owned by the CYCA commodore. Case has sailed 11 of his races with father Bernie who has sailed 40 Hobart races! Case is also believed to be the youngest (at 41) to achieve his 25 races. 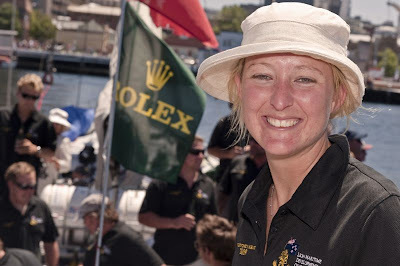 Sarah-Jane Blake, who completed the Hobart on board LION NEW ZEALAND. 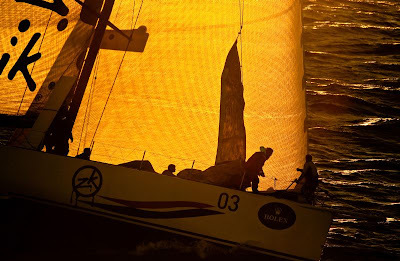 Image copyright ROLEX/Kurt Arrigo. Another unique aspect of the race was that the ORCi rule was introduced for the first time, with one third of the fleet sailing under the rule. 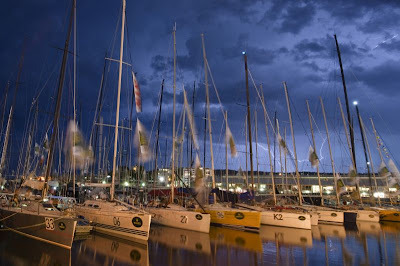 Interestingly, the IRC overall winner, Two True, also won under ORCi. 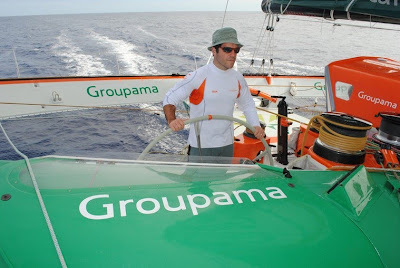 The only anomaly was Pinta-M, which moved from 25th in IRC to fifth in ORCi. A replacement for the IMS rule, ORCi is proving popular due to a number of owners expressing their preference for a measured, transparent rating rule. New Year's fireworks in front of the docks in Hobart. Image copyright ROLEX/Kurt Arrigo. 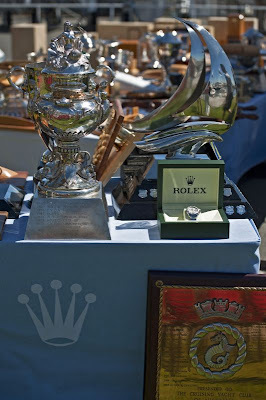 Rolex Sydney Hobart Yacht Race trophies and Rolex timepiece. 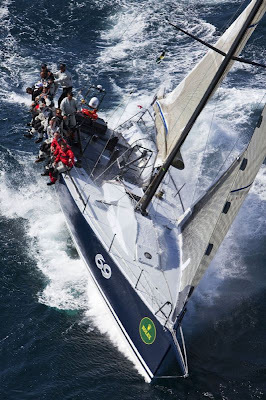 Image copyright ROLEX/Kurt Arrigo. 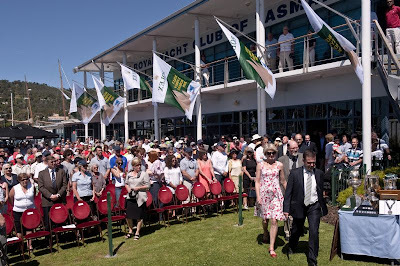 Owners and crews, friends and family, gathered on the Royal Yacht Club of Tasmania lawn in warm sunshine today for the presentation of trophies for the 2009 Rolex Sydney Hobart Yacht Race. They saw the trophies more widely distributed than usual with the race's varying wind patterns suiting the smaller boats in all handicap divisions. The winds alternated between calms and light air to strong 25-35 knot headwinds and tailwinds. And there were opportunities to gain a push south in two major eddies of the East Australian Current, which extended into Bass Strait, between the Australian mainland and Tasmania, further than usual. At different stages of the 628 nautical mile race, IRC overall handicap leaders varied throughout the fleet, between one of the biggest yachts, the Reichel/Pugh 100 maxi Alfa Romeo (Neville Crichton) and the smallest, Zephyr Hamilton Elevators (James Connell), a Sea Nymph 33. 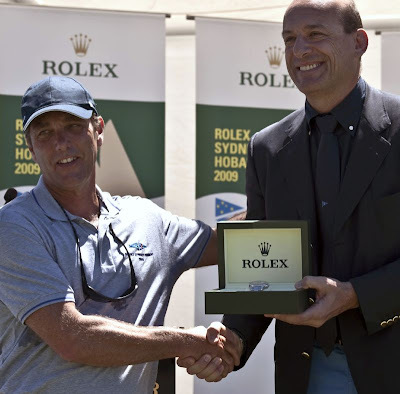 Andrew Saies presented with a Rolex Yacht-Master timepiece by Matteo Mazzanti, Rolex SA. 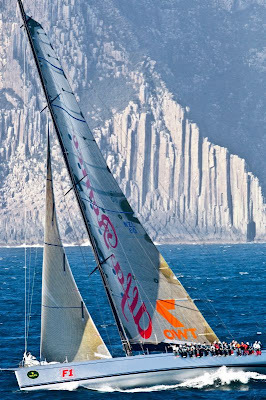 Image copyright ROLEX/Kurt Arrigo. 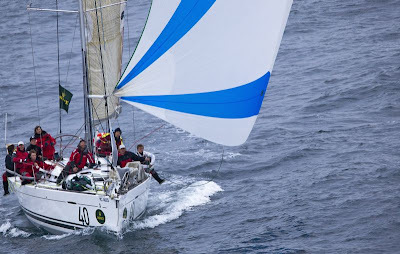 Zephyr was still poised to win at Tasman Island 40 miles from the finish until early morning calms in Storm Bay ended her chances. 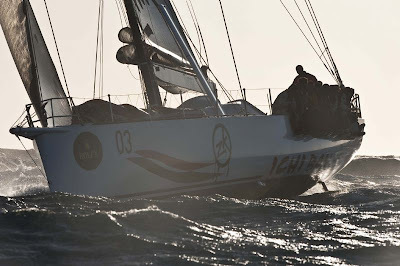 She finished seventh overall on IRC. In the end, smaller production yachts topped the podium. Two of the new Farr-designed Beneteau First 40s, Two True (Andrew Saies) and Wicked (Mike Welsh) placed first and second. Third and fourth were two of the Murray, Burns & Dovell Sydney 38 one-designs, Next (Ian Mason/Jay Krehbiel), and Swish (Steven Proud). These first four boats followed a similar strategy; heading well out to sea from the start, staying mainly east of the rhumb line and chasing the current eddies. And they pushed each other hard, racing one-design. 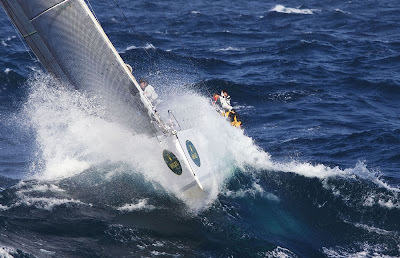 The two Sydney 38s ended their 628nm match race with a gybing duel over the last 11 miles in the River Derwent. 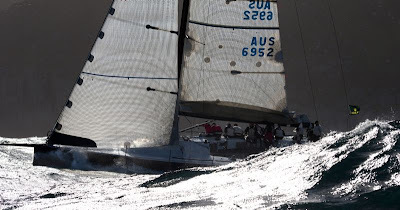 Next crossed half a boat length in front to win the Sydney 38 One Design division ahead of Swish, but placed fourth behind Swish on IRC overall because she has a slightly higher IRC overall handicap for carrying a masthead spinnaker. 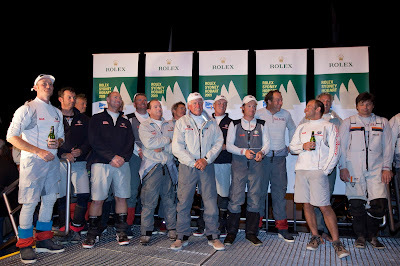 Next's skipper Ian Mason said: "It was a very tough race. It was just match-racing for nearly 400 miles with Swish. We were never more than about 800 metres apart and then she beat us by five seconds." Two True also won the ORCi division, introduced into the race for the first time this year in response to a growing push among Australian owners for a more measurement-based, transparent rule than IRC. Ragamuffin's veteran skipper Syd Fischer, strongly behind the move towards ORCi was surprised and gratified that 33 boats in the 100-boat fleet, raced under ORCi as well as IRC. "I think it will be a great rule because it's fully measured, transparent and we don't have anyone's input into it other than the measurements," he said. "It's fair. I can't stand anything that isn't fair because people spend a lot of money on these boats. If you look around the world there's billions of dollars spent on them and they've come into what's a club rule." 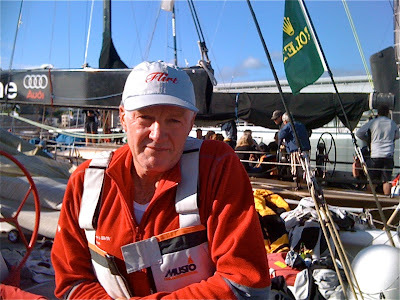 At the presentation, Matt Allen, Commodore of the race organizer, Cruising Yacht Club of Australia, who sailed his first Hobart race in 1976 and the 21st this year on his own modified Volvo 70 Ichi Ban, said: "The race to Hobart has certainly captured my imagination. Now it has never been in better health and I'm convinced that the best years are ahead." Matteo Mazzanti from Rolex SA presented overall winning skipper Andrew Saies from Two True with a Rolex Yacht-Master timepiece, and the Tatersall's Cup for the overall handicap winner in IRC. 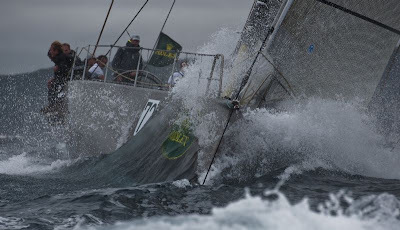 Sailes, sailing in his fifth Rolex Sydney Hobart, but on a brand-new boat this year, was clearly touched and said, "You can't win without a great boat, a great team and an ounce of Hobart luck..This is an iconic race, if you're a yachtie in Australia, you want to win this race." Official Trophy Presentation at the Royal Yacht Club of Tasmania. Image copyright ROLEX/Kurt Arrigo. Dockside ambience in Hobart. 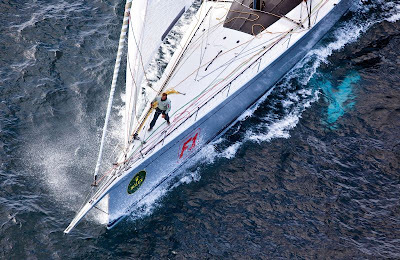 Image copyright ROLEX/Kurt Arrigo. 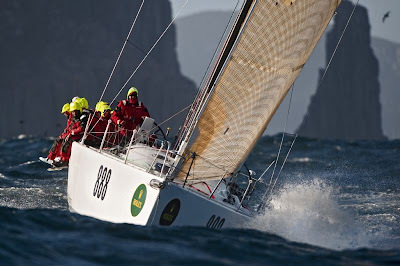 The 66th edition of the Rolex Sydney Hobart will start at 1300 AEDT on 26 December 2010. 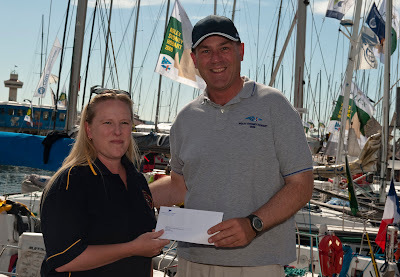 Angela Matthews, Secretary, St Helens Marine Rescue, receives cheque from CYCA Commodore Matt Allen, Chairman of CYCA SOLAS Trusts. 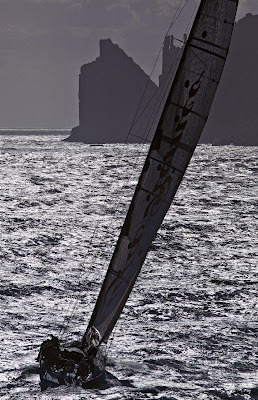 Image copyright ROLEX/Kurt Arrigo. 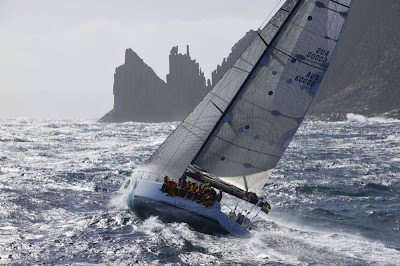 In its 10th anniversary year, the Cruising Yacht Club of Australia Sydney Hobart Yacht Race Safety of Life at Sea Trusts (SOLAS) has made a pledge to St Helens Marine Rescue Association Inc (TAS) of $20,000 as seed funding for the purchase of a new RIB. The RIB will provide additional rescue capabilities and support to the main rescue vessel, Freycinet, that the association acquired earlier this year from Tasmanian water police. The RIB will also provide an additional resource to the Break O’Day municipality. Earlier this year, St Helens Marine Rescue assisted local marine authorities when a commercial fishing vessel overturned on the Georges Bay Barway, rescuing three of the four crew members safely. Local marine authorities rescued the fourth crew member from the water. The conditions during this rescue were difficult at best and this incident prompted the need for a better suited, more manoeuvrable vessel. St Helens Marine Rescue Association is a wholly volunteer operated association, that maintains a 24/7 watch over the waters of the Break O’Day municipality and St Helens, providing support to commercial and recreational vessels. 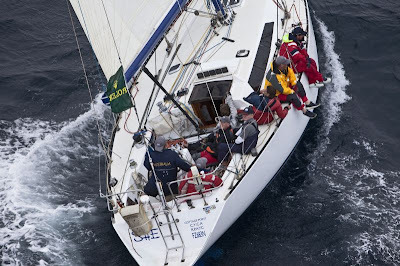 Additionally, the rescue service has provided valuable assistance to those yachts competing in the Rolex Sydney Hobart Yacht Race (when called upon) and the Launceston to Hobart race. “It is associations like these that are often first to come to the aid of yachtsmen, commercial and recreational vessels. The support that St Helens Marine Rescue has provided to the Rolex Sydney Hobart Yacht race over the years is recognised by this donation and we look forward to their continued support in the future, should it be required,” added Allen. “This RIB is a vital community asset and is greatly appreciated by the Mayor and the Break O’Day community,” said Matthews. One of the CYCA’s SOLAS Trusts objectives is to assist search and rescue organisations Australia wide. In the ten years since it was established, in excess of $500,000 has been donated to 17 organisations in every Australian state as well as the ACT. This is the fourth Tasmanian donation. 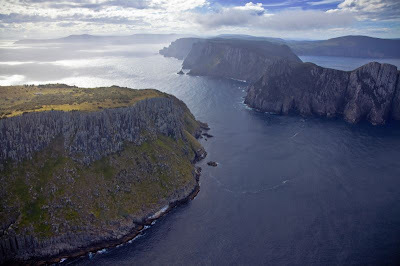 Other Tasmanian organisations to benefit from CYCA SOLAS Trusts donations are Tasmanian Air Rescue (two donations) and Tas Coast Radio. 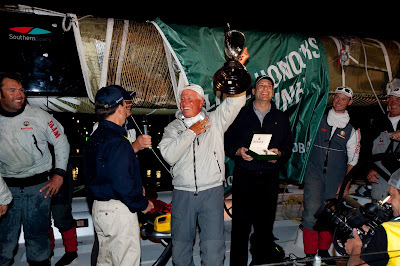 Neville Crichton holds the line honours trophy high on arrival at Constitution Dock in Hobart. Image copyright Alfa Romeo. The skippers of Wild Oats XI and ICAP Leopard have revealed how Alfa Romeo and its skipper, Neville Crichton, beat them in the 2009 Rolex Sydney Hobart Race, to take his 144th win in the second super maxi to carry the Alfa Romeo name. 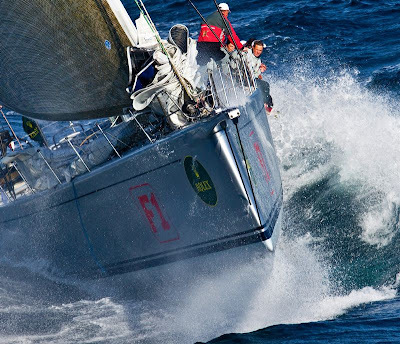 Alfa Romeo, the Line Honours winner of the 2009 Rolex Sydney Hobart, is the second of three yachts owned and skippered by Neville Crichton to carry the Alfa Romeo name. Alfa Romeo 1, a 90 maxi took 74 line honours with Crichton at the helm; Alfa Romeo 2, a 100 maxi now has 144 wins in her account, and Alfa Romeo 3, a 71 foot mini maxi which has taken part in a limited number of events this year, has nine line honours and two regatta wins from her debut season. 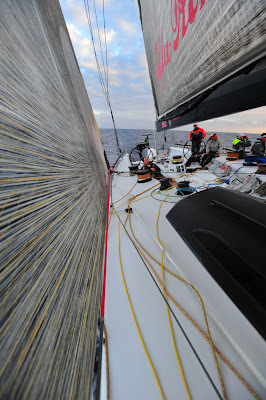 On board Alfa Romeo II during the 2009 Rolex Sydney Hobart Yacht Race. Image copyright Murray Spence. 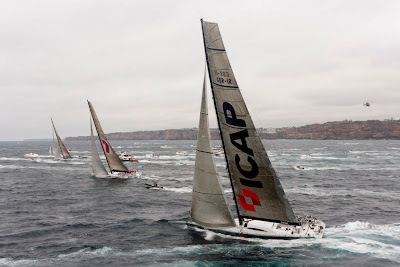 Despite this record of success, before the Rolex Sydney Hobart race started on Boxing Day Alfa Romeo, Wild Oats XI and ICAP Leopard were, to most commentators - and the skippers themselves, inseparable for line honours. At the start Alfa Romeo lead Wild Oats XI and Leopard out of Sydney Harbour on Boxing Day, having over taken them both in the sprint out of the harbor and, even during the race, it was so close that all three yachts were in sight of each other. Yet, at the finish it was not even close. 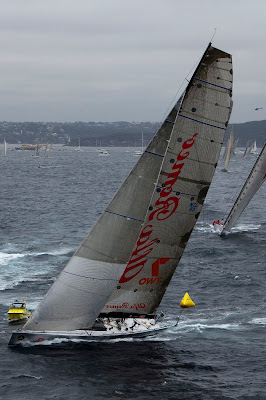 Wild Oats XI finished at five minutes after midnight, two hours and three minutes behind Neville Crichton's Alfa Romeo. Leopard, a Farr 100, finished at 0545, five hours and 40 minutes behind Wild Oats XI, nearly eight hours after Alfa Romeo. Mike Slade, owner and skipper of ICAP Leopard, had an historical perspective of the close three-way battle of the maxis: "When Napoleon turned up at Waterloo he knew he was in for a bad day, he had a bad day at the office didn't he? I've been a bit like that. It was a fantastic race and well done Alfa, bloody marvellous." Alfa Romeo II leaving Sydney en route to Hobart. Image copyright Alfa Romeo. Crichton commented: "They were good competitors but at the end of the day we had the better team." Crichton said that he was not surprised at the closeness of the race. At one stage earlier in the day Bob Oatley's Wild Oats XI clawed back much of Alfa Romeo's lead, to be within six miles of her. "I always believed you could put a blanket over the two boats and that's the way it was for the whole race. (The difference was) the 21 guys we have. We've got the best crew in the world." Crichton described the race as very tactical. "There were occasions when we had to take a gamble and hope it paid off. We were very busy the whole race. There were occasions when there was a lot of breeze, and occasions when we drifted, so it made the race much more interesting. "I don't think there was any part of the race that counted any more or less. We all had periods we were parked up. I think it was the advantage of making the least amount of mistakes of anybody that won us the race." 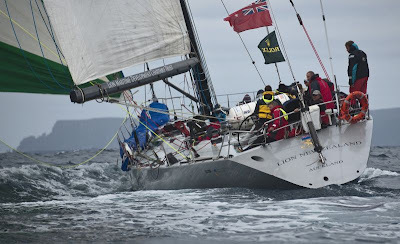 Tom Addis, Alfa Romeo's navigator, said that the hardest parts of the race were off Gabo Island Sunday morning, and getting through the big hole in the bottom half of Bass Strait last night. "It was a park-up," he said. "We were confident off Gabo, even though Wild Oats XI came up on us. It was painful, but you just have to be calm and get through it. "The Derwent is hard too," he added. "You go into it unaware of what the future holds. You see a glassy patch and your heart falls, but you just have to get there and deal with whatever is there, whereas the rest of the race you can plan." The crew of Alfa Romeo II on arrival in Hobart. Image copyright Alfa Romeo. Helmsman Michael Coxon said that what made the race so taxing were the number of parking lots. "We averaged a 15 to 20 mile lead over Wild Oats XI but you can park up in the last 70 miles of the race and they can sail straight through you. That's always in the back of your mind." This is the 144th win Crichton has enjoyed at the helm of Alfa Romeo, but winning line honours this time has been especially sweet. Unfinished business has at last been done. 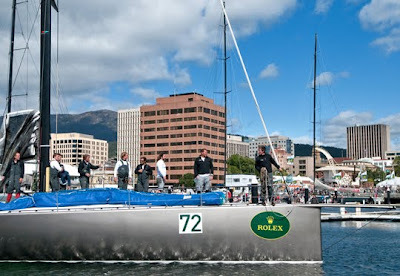 "The Rolex Sydney Hobart is the ultimate," he declared, "and to win it is a good thing to have on your resume. We've done it twice." 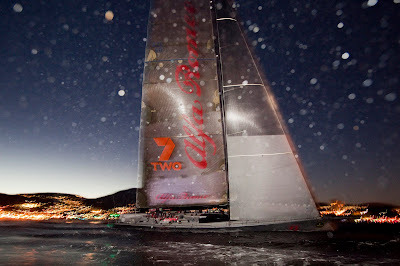 Alfa Romeo II crosses the line in Hobart to take line honours. Image copyright Alfa Romeo. This is the video that was presented by Russell Coutts at the World Yacht Racing Forum in Monaco, December 2009.